It's been ages since I've added an entry to the King/Bourke Quest, my ongoing search for good lunchtime fare walking distance from the building where I work on the corner of King and Bourke Streets, in the depths of the gastronomic wasteland known as the Melbourne Legal District. 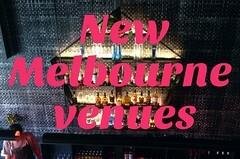 Today's entry is +39, located on Little Bourke Street just down the hill from Sette Bello and (the now sadly defunct) Base Kamp. Thanks to mellie for alerting me to it last month! 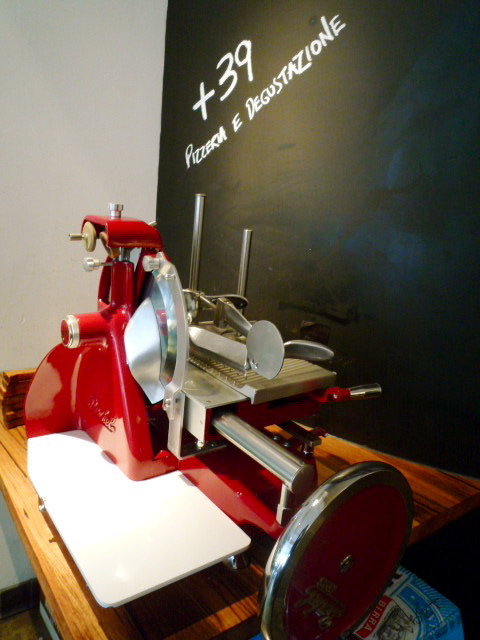 Plus Thirty-Nine (or Più Trentanove, if we're going to get all mother-tongue about the Italian international dialing code) serves up wonderful, inexpensive pizzette, panini, piadine and pasta in a slick, modern vault of a place. It's run by Remo, one of the original Italian Stallions that used to charm me and chat in Italian at Carlton Espresso back when I was at law school. 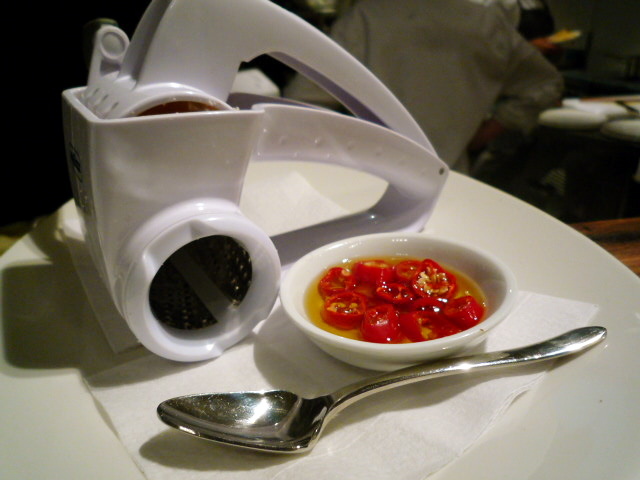 One of the little touches I love at +39 is the pasta condiments: a tiny bowl of fresh cut chillies in olive oil, and a cheese grater doohickey dispensing Parmigiano Reggiano. Bravo. On my first visit there was no need for grated cheese - I had the Spaghetti Porri ($15) with caramelised leek and gorgonzola. Just brilliant! 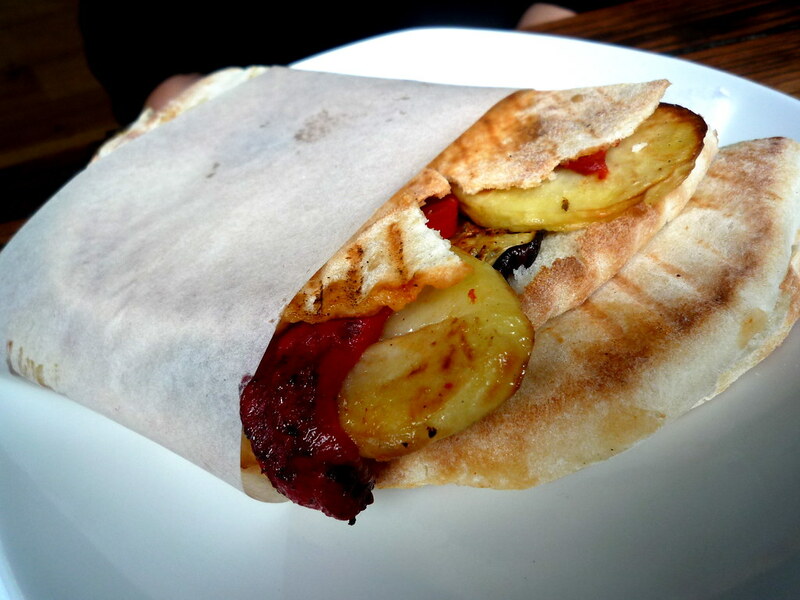 My colleague Miss B who was joining me for lunch enjoyed a hearty toasted panino with marinated capsicum, eggplant and potato. I went back again last week with with O. 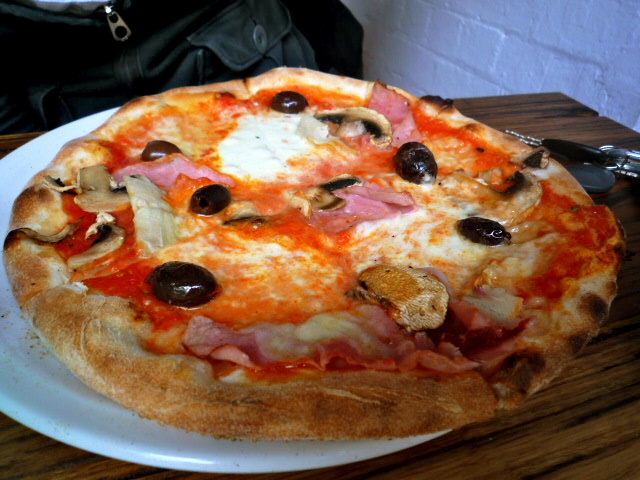 We shared two pizze: one with fresh mozzarella, baby broccoli, anchovies and pine nuts, the other a Capricciosa with tomato, fresh mozzarella, leg ham, mushrooms, artichokes and Ligurian olives. Both were excellent - an authentic slice of Italy - and were only $10 each! They'd run out when I was last there, but next time I'm keen to try the Gratin, which comes with fresh mozzarella, eggplant, breadcrumbs aromatised in garlic and olive oil with cherry tomato. We'd filled up on pizza so we didn't have any of the delicious cakes or bomboloni. 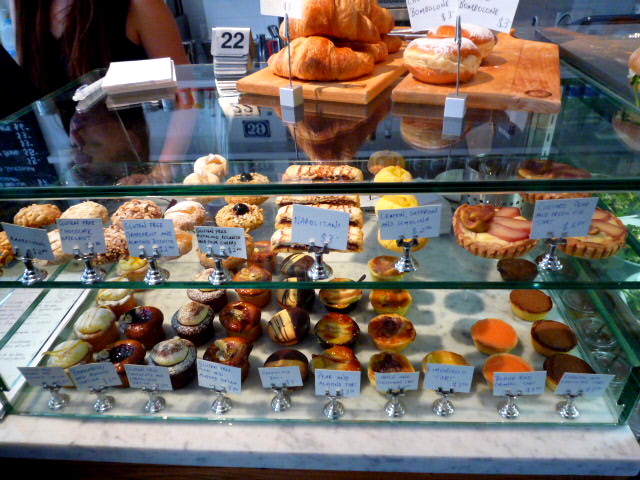 If we had, I would TOTALLY have gone for the custard pear and fig tart on the right - it looked sensational! I used to work in that building as well (I am guessing which one it is) and I agree - a culinary wasteland. I do miss the smxl fresh salmon sandwiches though despite their high price tag... 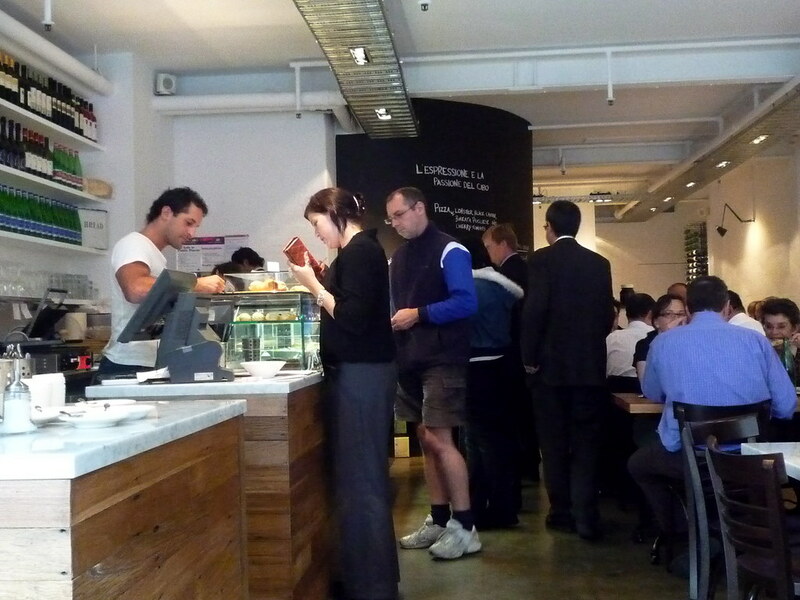 The lawyers from Freehills and the "Paris end" of Collins street have so many more food options. I do like smxl (especially their m'oaves and their new coconut and banana bread), but we desperately need more variety in this neck of the woods. Which day did you go? I swear I must have just missed you. 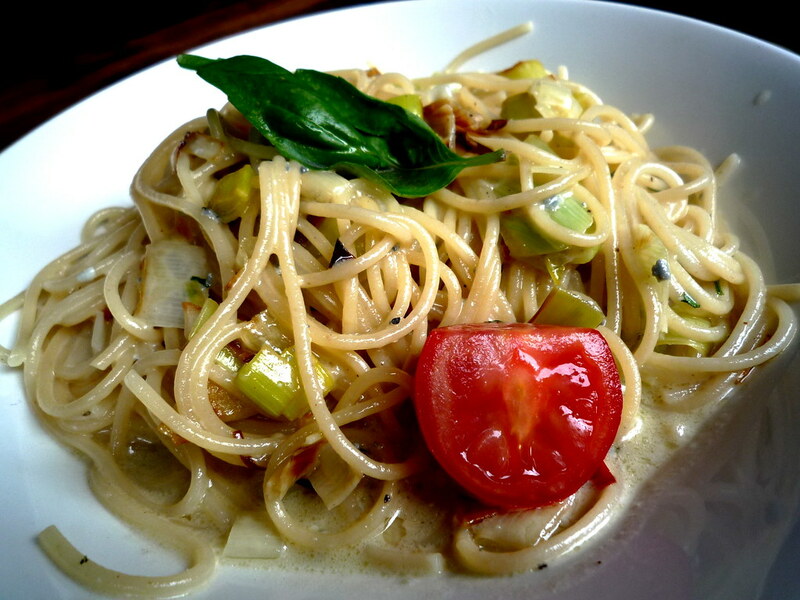 I shared the leek and gorgonzola pasta with my friend. 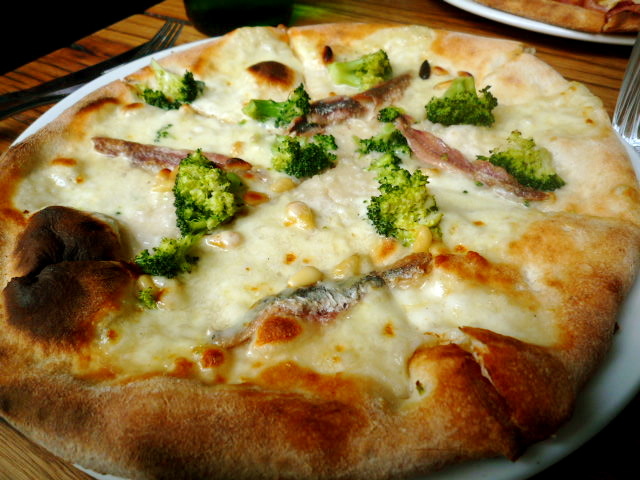 I desperately wanted the broccoli pizza but they were against the idea of anchovies. I think it was a Tuesday I went there. The caramelised leeks were awesome, weren't they! Last time I checked though, I think they weren't on the menu any more. Sad face. Oh, and time to cut loose friends that give anchovies the thumbs down!! 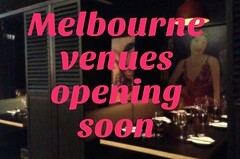 Visit their website to view the menu, read the reviews and see photographs, http://plus39.com.au.